But the Pumas lost some structure as the match wore on.. The All Blacks have totally dominated the last 15 minutes. Ben Smith makes a strong run for the corner but is stopped in his tracks by some great Argentinian defending. The ball dribbles out into touch. It's been an incredibly enthralling watch this morning. For 40 minutes the All Blacks were behind and Argentina looked capable of pulling off the second major upset in two days. But the All Blacks conditioning, depth and composure has helped them to a 10-point buffer with two minutes to play. Into the last minute now and Argentina have the ball on halfway. All Blacks turn it over, kick in behind the Pumas and they try to run it out from deep. It's all over. The All Blacks have beaten Argentina 26-16. Thanks Steven, been great as usual. Have a great week. Make sure you stick around. Herald rugby expert Wynne Gray will join us in 20 minutes for a Live Chat, where he answers all your questions from today's game. Send your questions in now. Until then I will bring you all the post-match quotes and reaction. This wasn't so much a bullet dodged by the All Blacks, but a blue-and-white striped missile. 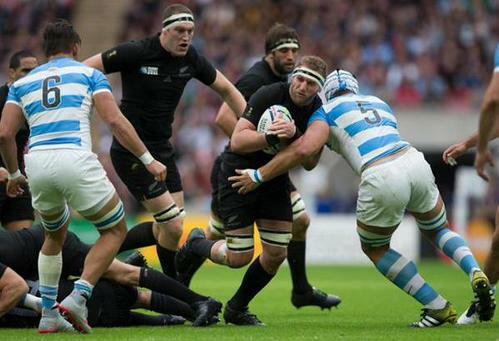 On a day when history was created - the World Cup's biggest ever crowd of 89,019, the All Blacks prevented two more. They have never before lost a World Cup pool game or a test to Argentina. And, with both Richie McCaw and Conrad Smith in the sinbin at the end of the first half and Argentina holding a 13-9 lead, a defeat looked a very real possibility. While Smith saw yellow for a ruck infringement - and it was a close run thing - McCaw isn't likely to be happy with his decision to trip Juan Martin Fernandez Lobbe. It brought jeers from the large Pumas contingent in the crowd and contributed to his team playing with 13 men for the remaining 92 seconds of the first half. 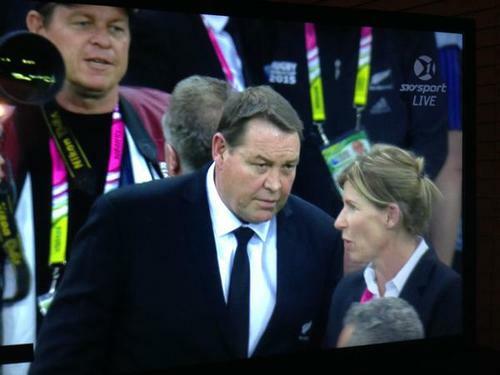 Not ideal, as coach Steve Hansen might say. Argentina captain Tomas Cubelli: We played a good game, it was good work. We knew it would be difficult to maintain our high level for 90 minutes and have some things to work on. Cubelli: We showed that we like difficult sides. We came here to play World Cup rugby to the end of the tournament and that's what we will do. 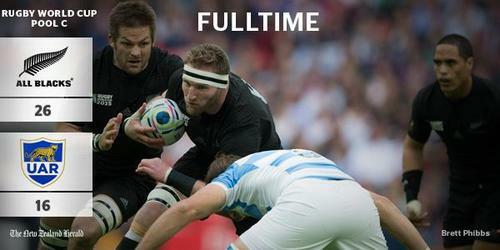 All Blacks captain Richie McCaw: That was what we expected first up, a really tough challenge. But I thought in the second half we were a lot more clinical. We didn't get all the points we could have got but we did enough to stay in control..
McCaw: This is a magic place to play. It's one of the best grounds in the world to play at. 90,000 fans screaming was amazing, it's what you play the game for. McCaw: It's been a while since our last game and we've been here for 10 days so it was a relief to actually get out there and get started. Now we're underway we can assess where we're at and make a lot of improvements and that's the nature of rugby. Gregor Paul from Wembley Stadium: It fell into a predictable pattern in the end, but a nation was left wondering for what would have felt like an interminable period as to whether it ever would. Argentina were always going to be hard to break down. But they were really hard this time. Worryingly good for periods to rattle the All Blacks and make things way more nerve racking than any Kiwi would have enjoyed. Gregor: The All Blacks, as always, will be focused on the obvious improvements they must make, they should still take the time, though, to acknowledge that there was much to admire in the way they held themselves together and were firing pretty close to their best by the final quarter. Keep firing your questions through guys, Herald rugby expert Wynne Gray will be with us very shortly to answer them in our Live Chat. Right, time to get started. Wynne will join us for the next 45 minutes. Keep firing your questions through. Based on this game do you think the All blacks can win the world cup? What did you think of Wayne Barnes' performance? Were all the yellow cards justified? Wynne: Do you know why SBW was slotted in for Nonu (rather than SBW for Conrad, and then moving Nonu down to 13 like they did earlier this year)? 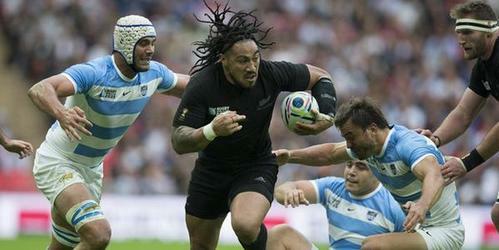 Nonu looked to be the best AB during the first half. Was it an injury? Must have been some injury. Like the SBW/Smith combo better than Nonu/SBW one. Think SBW is a much better fit at 12 where he plays best for the Chiefs..
Hi Wynne, what did you think of Dan Carter's performance? Good with the boot but did he attack the line enough? Very solid. Think they had a plan to get him through this game and early one he as very flat and attacking the line. Looked composed, that's what we need. With the next two games being easy for NZ will that help improve the performance?